It has become well known that seasonal ice flow variability of Greenland outlet glaciers may often be associated with the drainage of supraglacial lakes that accumulate meltwater during summer. However, tracking the details is inevitably limited due to the fact that the mechanisms and rates of meltwater transfer are hidden from view, and theoretical models are fraught with a number of difficulties. 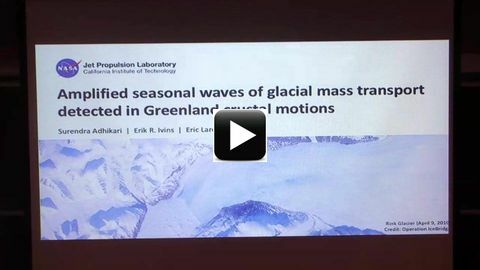 Here we use a previously unrecognized source of data that constrain the mass transport during a season of intense Greenland melting and document the evolution of a mass transport wave as it passes down glacier. The breakthrough is twofold: demonstration of the power of the new technique and the first measurement of the mass amplitude. The technique is effectively using the measurement of the deformed solid Earth elastic response as a filter that uniquely responds to neighboring glacier mass changes. We quantify that the wave through Rink Glacier is enormous in terms of its mass transport, amounting to about half of the average annual discharge during 2000-2005, and travels at an average speed of 7.1 km/month. Our mass transport wave measurement is the first of its kind, on any of the major outlet glaciers of either Greenland or Antarctica.